Behind many great wrestlers over the years has stood one remarkable Woman. Now she's standing behind Chris Benoit-and Kevin Sullivan is furious! There's a gleam in Woman's eye that can turn a man to jelly ... should she desire it to do so. It's a gleam that promises the earth, the moon, and the stars, and guarantees that the man caught in its gaze does her bidding ... for as long as she chooses him to do so. ... during the years she managed Sullivan himself. ... during the time she was associated with the tag team known as Doom. ... during the various times when she was working with "Nature Boy" Ric Flair. ... even while she was in ECW alongside The Sandman. But Chris Benoit? No, Benoit is a different situation entirely. "You gotta see what happens to Kevin when somebody starts talking about Benoit around him," said Jimmy Hart. "It's wildness, man. You can just see him simmering and percolating, and the steam is rising and the pressure is building and-man, oh man, I just decide to get out of the way when I see him get like that. That's all you can do." "I was in the dressing room with several wrestlers, Sullivan one of them, when that video of Woman and Benoit was first shown," said WCW broadcaster Tony Schiavone, referring to a televised segment showing Benoit and Woman sipping wine at a restaurant during WCW's last tour of Germany. "His eyes were like laser beams riveted to the screen. Of course, some of the comments the guys were making didn't help his attitude any, but you'd think he'd be used to that over the years. And usually he's fine. But Benoit? There's serious hatred there, that's for certain." That hatred has been manifesting itself in a series of particularly brutal falls-count-anywhere bouts between Benoit and Sullivan. For his part, Sullivan has been wrestling like a man possessed, displaying a fury and a passion for victory that some say, hasn't been there in years. "Hey, brother, if you ask me, it's just a matter of Woman doing a little dance to get Sullivan all jealous, and it looks to me like it's working!" said Steve McMichael with a chuckle. The other members of The Four Horsemen, however, aren't taking the situation so lightly. "Stylin' and profilin' is one thing, baby, it's the way of nature, and the way of the 'Nature Boy,'" said Ric Flair. "But I gotta tell ya something, baby, if a man ain't takin' care of business first, he's got no reason to style or profile. Now I'm not saying that Benoit's falling out of favor with the Horsemen. No, no, no. He's a great wrestler, a man's man, and a valuable Horseman asset. All I'm saying is that he'd best be careful about where and when and how he's spending his time. These things have a way of sneaking up on you. Trust me, I've been there, I know exactly what I'm talking about." Arn Anderson was slightly less diplomatic in his comments. "This could tear us apart," he told Inside Wrestling. "I'm real supportive of Benoit and Woman, but they're on the verge of taking this thing too far. They don't need to be riling Sullivan up any more, and I want it to stop!" But Benoit feels that what he does on his own time is nobody's business but his own. 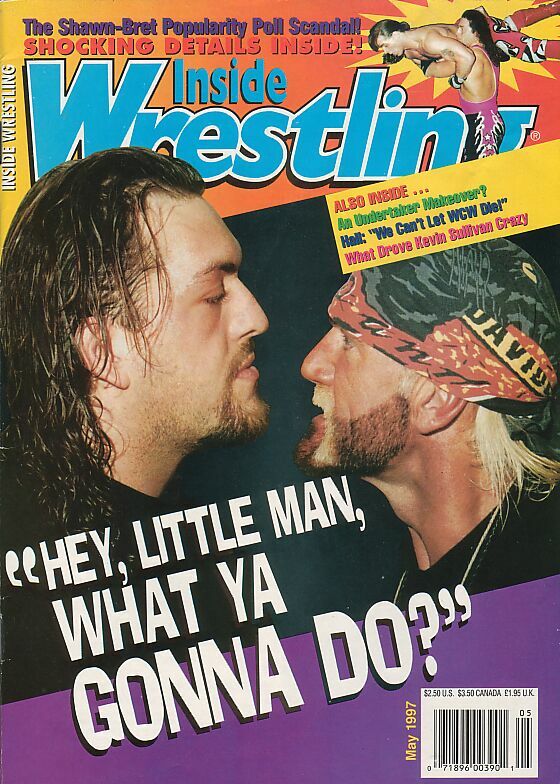 "No one tells me what to do," Benoit said when told of Anderson and Flair's remarks. "What do they wanna do, become my baby-sitters? Nursemaids? Whose business is it what I do on my own time? So what if Woman wants to be proud that she's hanging with me-do I have any control over that? That's her business. "Look, Flair is the last guy on the face of the earth who should open his mouth about anything, and sometimes I think Anderson and McMichael should just keep their thoughts to themselves. I'm doing what I want to do when I want to, where I want to, how I want to, and why is nobody's damn business." But Benoit is a Horseman, and the demands of being a Horseman require that one be a Horseman 24 hours a day, seven days a week. And if Benoit is seen to be breaking that requirement, then the other Horsemen-particularly Flair-will speak out about it. "This isn't about a little indiscretion, this is about something much bigger," McMichael retorted. "What makes Benoit think that maybe Woman isn't working with ulterior motives? Ha! Like that hasn't been known to happen! She could be an agent of the NWO for all we know! Maybe Sullivan and Hogan have made a deal! Maybe she's trying to soften Benoit up for a bigger kill!" But Benoit maintains he's not about to listen to anyone. And Sullivan? "Sullivan is just out of control over this thing!" Hart said. "He's wrestling like a wildman, but he's a wildman out of the ring, too. It's eating him up, this Benoit thing, more than anything Woman's done in years. This is too personal for him. They're throwing it in his face and laughing about it. No one does that to the 'Taskmaster.' You can't talk to him rationally about it, baby. It's got him all twisted up in knots, all bent out of shape. It's changing him-big-time!" That gleam in Woman's eyes.